Once you take this class, you’ll be able to make so many desserts from just one dough. 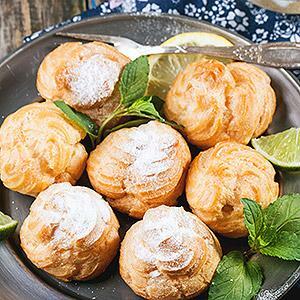 It’s called pâte à choux (also known as “choux pastry”) and is a rich and classy French dough that’s made on the stove top, which makes it entirely different than other pastry doughs! This morning, experienced instructor and Pastry Chef Nora Kaschube will teach you how to transform this classy dough into gorgeous Cream Puffs, Eclairs and other variations. You’ll also up your game when you know how to make the pastry arts staples known as Pastry Cream and Chocolate Ganache. If you’ve always thought these beauties were too hard to create, Chef Nora will surprise and delight you as she shows you how easy it really is! You’ll get your hands in the dough as you work next to Chef Nora and practice the tips & techniques you’ve learned in class. Won’t you be fancy! Sun 6/2/19 10:00 a.m. - 12:30 p.m.